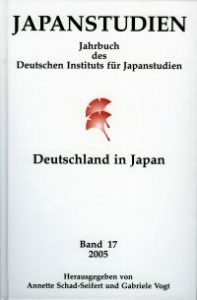 On the occasion of the initiative “Germany in Japan 2005/2006” volume 17 of Japanstudien is dedicated to the relations between Japan and Germany in the modern era. Since the Meiji period both countries have enjoyed continuous periods of contact that have led to processes of mutual reception and cooperation in culture, science, economics, and politics. This volume sheds light on the historical background of these processes on the Japanese side by examining the changes in interactions with Germany in modern day Japan. A further topic that is addressed is the Japanese perceptions of Germany that have shaped the recent processes of reception and cooperation. The volume is edited by Annette Schad-Seifert (schad@dijtokyo.org) and Gabriele Vogt (vogt@dijtokyo.org). Published in December 2005.